CWC Limited Petite Blythe "Secret Midnight Tea Party"
CWC Limited Petite Blythe, "Secret Midnight Tea Party" is a collaboration with "Queen of Hearts' TEA TIME", the Grand-Prix winner in the 'Petite Beauty Category' of the 3rd Annual Blythe Beauty Contest 2008. Her winning entry had three dolls with a Little Lodge showcasing a queen. 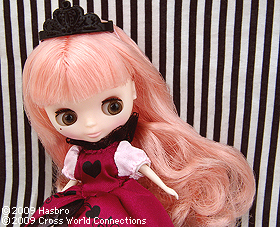 This centerpiece was taken and enhancing her charm and atmosphere, developed into this limited edition Petite Blythe. At midnight, the portal between yesterday and tomorrow, you will see a glimpse of castle of Queen of Heart. There, the Queen holds a secret tea party, inviting only certain special guests. Surrounded by candy and lovely flowers, you will stay as a girl, eternal. Let’s hold another secret tea party tonight! 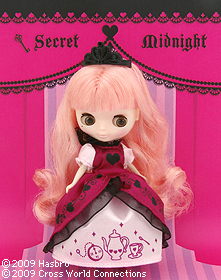 "Secret Midnight Tea Party" wears a sweet yet mature long gown in light-pink and wine-red. A stand-up collar and over-skirt is trimmed with sophisticated black lace. Cute prints of hearts, a tea set, and a clock pointing to midnight illustrate the under and over-skirts. Wine red lace-up boots and a black tiara complete this noble style fit for a Queen. Slightly orange pale-pink hair is banged and long with curls at the end. Pink eye-shadow, cheek and lip make-up add subtle glamour on her fair skin. The brown mole by her eye makes her stand out from the rest. Would you like to join the secret tea party? The invitation card is included in a package. 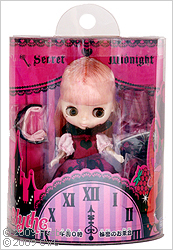 [ The set includes ] Doll, Tiara, Satin Ribbon for tiara, Dress, Boots, Invitation Card and Stand. 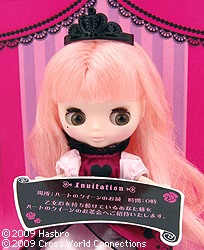 Available at all Blythe Shops (including Blythe Top Shop) in Japan from 27th November.